Watch Horton Hears a Who! "A persons a person no matter how small!" 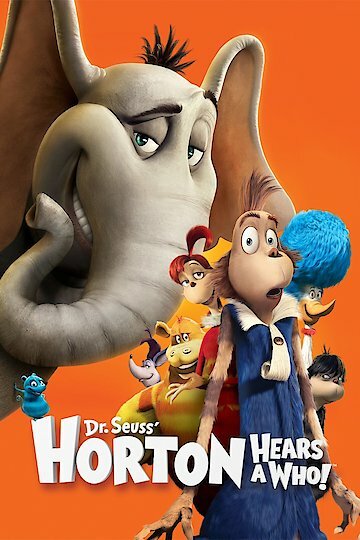 Horton Hears a Who is about an elephant named Horton. He lives in the Jungle of Nool and is the jungle’s nature teacher. He finds a speck of dust which he is convinced he heard a noise from. Horton carefully places the speck on a clover to protect it better. Much to Horton’s surprise, an entire city is inside the speck. Because of his oversized ears, he can hear the people that live on the speck although everyone else that he knows thinks that he is just talking to himself. One of the people of Whoville that Horton befriends is the Mayor. The Mayor of Whoville does not quite know how to stand up and win against the elders of the town. The Mayor has a wife and ninety-seven children. The children are comprised of ninety-six daughters and one son. The girls’ names all start with the letter “h” but the son’s name is JoJo. The Mayor goes to the smartest person in Whoville to find out what will happen to the town since he has learned that it is a tiny speck. She informs him that if they do not find the speck a stable and secure environment, the town will be destroyed. He then tells Horton who spots a perfect place atop Mt. Nool. Horton begins his journey to the mountain and runs across a kangaroo that does not believe his beliefs. She eventually turns the entire jungle against him. The Kangaroo enlists the help of the monkeys who love making people feel miserably and a vulture to get rid of the speck by force. The marching hoard eventually catches up to Horton and tries to destroy the speck. The people of Whoville make as much noise as possible, hoping that everyone else will hear them before they are destroyed. JoJo ends up breaking the barrier and the kangaroo’s son saves the town from destruction. More Like Horton Hears a Who! Horton Hears a Who! is currently available to watch and stream, buy on demand at Vudu online.